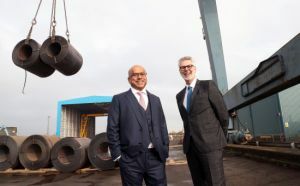 Sanjeev Gupta, owner of up of energy, mining, engineering and logistics conglomerate GFG Alliance, has unveiled a £5m investment to revitalize Bird Port on the river Usk at Newport. It follows the announcement last July that the SIMEC Infrastructure arm of GFG had agreed to buy the facility along with its Cargo Services stevedoring arm. Mr Gupta (Pictured, left) said the facility, which was first opened in 1900 and described as South East Wales’s last remaining commercial river port, would become a “vital piece of infrastructure” underpinning new industrial activity, including steelmaking and green energy generation in the area. SIMEC plans to double the capacity of Bird Port. According to a statement, it is the only fully-undercover cargo-handling facility on Britain’s west coast to allow loading and unloading of sea-going vessels in all weathers. It also has a covered rail link. The port is also adjacent to Gupta’s Liberty Steel Newport rolling mill where he plans to install an electric arc furnace for recycling scrap metal. There are also plans to create new facilities to handle shipments of scrap steel destined for recycling in South Wales and the plans include 50,000sq ft of waterfront warehousing along with dredging and upgrade work to re-open the currently mothballed second berth at the port. At present the port handles up to 30 ships a month but SIMEC Bird Port aims to increase this to over 40, handling cargoes such as steel coil for the automotive industry and rod and bar for the building sector to bulk materials such as aggregates for road construction and agricultural materials. The port currently employs about 70 people but this is expected to rise to over 100. GFG also plans to improve the deep-water jetty at the steel mill enabling the two ports to work in tandem. The revamped port is also expected to supply Uskmouth Power Station, owned by another GFG Alliance member company, SIMEC Atlantis Energy which is being converted from coal to pelletised waste in order to provide green energy to Liberty Steel Newport. In addition to Bird Port and Cargo Services, SIMEC has also acquired two of Cargo Services’ subsidiary companies in Newport – timber merchants Wm Shapland & Sons and road hauliers, Ryan Transport.